Virgin Oil de Coco-Crème® is the product of my circumstances and a lifetime of hard work. Creating Virgin Oil de Coco-Crème® was the successful end to an incredible journey I had unknowingly been on since childhood. During this journey I met many remarkable people who helped with this project and I owe them my gratitude. My idea began to take shape in earnest in the early 1990’s while I was working in a coconut processing plant in Indonesia, which was shortly to become one of the largest producers in the world. As a new company, they were innovative and one of the early projects was to make “white coconut oil” from fresh coconut cream. The goal was to make a natural ingredient for pharmaceutical, cosmetic and medical applications; the oil should be extracted without the use of chemicals or fermentation, and without drying. It should be unique, something that cannot be easily copied. Instead of focusing on the processing alone, the technology was separated into 3 mini-series: raw material preparation, extraction – separation, and purification. Patents and ownership of these entries are independent from each other. To make Virgin oil de Coco-Crème® these 3 technologies are united; hence, we call it the cold centrifuge series™. As a young professional, with a background in science and engineering, I became a key player to develop the “white coconut oil.” It would be a new type of virgin coconut oil with appeal for people all over the world, not only to people in coconut growing countries. The project was a success and the prototype was evaluated by a leading Japanese pharmaceutical company with excellent results. However, marketing reviews questioned the affordability of this new product and the newly discovered product was put on hold because of uncertainty over financial viability. I kept 8 samples of the 1991 prototypes. One of them is just starting to go off after 20 years! In 1995, while completing my Master’s Degree in Food Bio-Process Engineering at the University of Guelph (in Canada) the hope of Virgin oil de Coco-Crème® began to resurface. I recall that I had just finished in the laboratory for the day and I applied some of the oil on my skin as I was preparing to leave. My colleague Dina, from Tanzania, noticed the oil. She could not believe that it was virgin coconut oil. It was so different from the virgin coconut oils in Africa processed by the traditional method with which she was familiar. I ended up giving her the rest of the bottle and I realized that, “Yes, technology can make a difference and sharp, discerning people will notice and appreciate it.” I told my close friends of the oil and they encouraged my idea to bring this wonderful, natural, pure white coconut oil to North America. knew where to go and I knew the technology – the cold centrifuge series™. The first destination was Sumatra, Indonesia, where the “true virgin coconut oil” was first conceived over 7 years before. The idea was reviewed and put on hold until we could provide a definitive complete market study to support a fully fledged venture in this product. Then the never ending road led to the Philippines, Malaysia, Costa Rica, and Dominican Republic followed. Just as we were ready to give up, we found a manufacturing facility in India that could produce a product within 80% of our requirements. The first batch of Virgin oil de Coco-Crème® made in Southern India reached western shores in 1998. By 2001, the first producer of Virgin Oil de Coco-Crème® succumbed to financial failure due to the costs incurred in marketing too many new products too quickly. 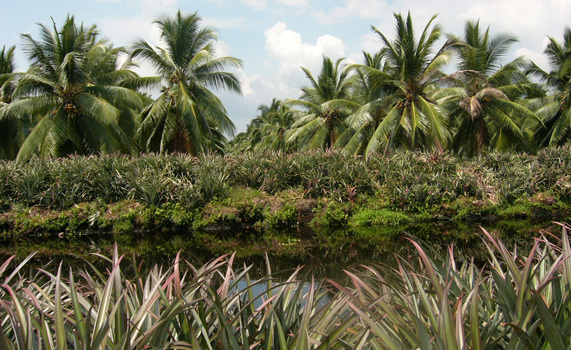 The manufacturing of Virgin Oil de Coco-Crème® returned to where it started: Sumatra, Indonesia. The next 3 years were full of challenges. Coconut oil had a badly maligned reputation which needed to be overcome. In addition, even people in the coconut industry had any knowledge of non-copra coconut oil, it was completely new. And those few consumers and manufacturers who did use coconut oil could not believe that a virgin coconut oil could not be immaculate white. Our wonderfully natural new product was completely unheard of at the time! We were able to overcome these challenges, because the product was phenomenal and the words “centrifuge extracted” quickly became a marketing buzz, even among those who do not use any kind of centrifuge technology. Today, virgin coconut oil produced from various technologies is widely distributed in the health food industry, competing with other nutritional oils. To date, no other manufacturers have come up with a way to make as pure a virgin oil as our Virgin Oil de Coco-Crème®. Since it is expensive to make and market, many of the earlier distributors abandoned it in favor of inferior coconut oils and higher profit margins. The good news is that along the way coconut oil manufacturers were forced to innovate traditional processes of virgin coconut oil and today most can make a fairly good product. I am glad that I am able to participate in this area of innovation. These innovations have resulted in inexpensive virgin coconut oil for the broad marketplace. However, very few of those who market virgin coconut oil really understand the complexities of the product and spend their efforts simply marketing what they think they can sell. I believe that this could someday have a negative impact on the prospects of coconut oil. I am pleased to see that coconut oil is being rescued from years of unfounded negative publicity. The years ahead will bring many more challenges for coconut oil, but this miraculous plant- often known as “the tree of life”- will survive.